Auto book levelling for reading ages. Download now and use freely in demo mode. Once purchased, your unlock code is emailed to you and your file copy unlocks to full version automatically retaining all your data. 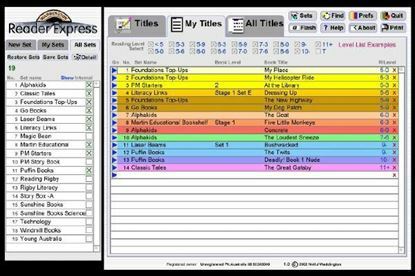 Reader Express is an outstanding self-running program for portable and networked computers. Will match students to 18 realistic reading levels based on universal reading ages! Directly assists reading programs, resource organisation, LAP programs and targeted book purchases. This software is the official replacement for our past Reading Modules.